Somewhere between a mistress and commitment. This is a last minute post before the end of 2013 since I've been very busy (read: lazy but also busy) in the past few weeks. All the things I have a crush on right now are in this post: tartan/plaid shirt, comfy sneakers, deep red lips (I have a beauty & goodies post coming soon) and well black, black, black and more black - more or less my daily uniform. Lately I've been all kinds of sad not being able to go home for the upcoming holidays, so I have to make the best of Christmas in Berlin (and I'm not a big fan of Christmas Markets). Ohh well, when I'm not on the blog, you can find my almost daily posts on Instagram. Twenty something. Compulsive shopper. Berlin based. Romanian born. Food-obsessed. Instagram addict. Web savvy. Pinterest pro. Hooked on Swedish minimalism. 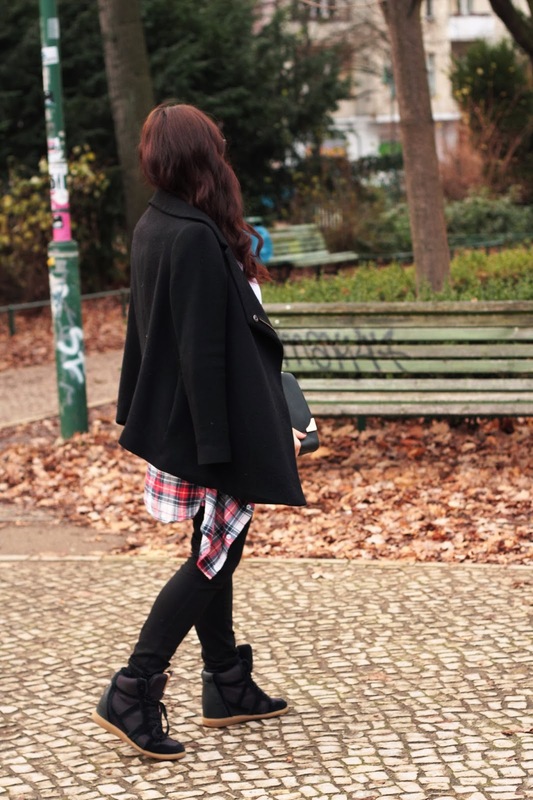 Fab look, love boots and bag and your hair colour! omg, you're so pretty ! Have a wonderfull New Year's Eve! Thanks dear! Hope you had a nice NYE celebration too! Thanks Maja, have to dye it again, Arrrhhh! Hope you had a nice Christmas too! I Heart Black. Powered by Blogger.